A cousin perhaps alive today? They may have already been on their way to the hospital, 78 years ago today. They had to have known, the granduncle and grandaunt of The Legal Genealogist, that there were not one but two babies on their way. And they must have been feeling a combination of joy… and terror. Joy because of the potential for new members of the family. Terror because they had already lost so many. As far as I’ve been able to determine so far — German privacy laws are very strict — Gerd and Sophie had at least eight children. As to two of them, all I know is what are probably their call names2 — there was a girl called Wilma and a boy called Friedel — and what they looked like in a 1932 photograph found in my father’s papers after his death.3 Wilma looks to be 10 to 12 years old in the photo, and Friedel perhaps 12-18 months old. I can’t begin to imagine, then, how they must have felt heading off to the hospital this time. It does appear that Wilma and Friedel were living then — I can’t find any death record for any Nuckel who matches what I know about these children — but having some living children can’t erase the pain of losing others. Nor can it relieve the fear those folks must have felt. I know a little of what happened in that September 78 years ago. I know that around 4 p.m. on the 25th of September 1938 there were twins born to Gerd and Sophie.12 And I know what happened to one of them. One of them didn’t make it. But I have no idea what happened to the other twin. I don’t know if the child was a boy or a girl. I only know that there is no entry in the funerary books of Bremen for another Nuckel child. No indexed death of another Nuckel child. So I have my fingers crossed that another Nuckel child lived. That — perhaps still alive today — I have another cousin. That that cousin, or a descendant, might someday come across this blog. That we might someday get to meet. 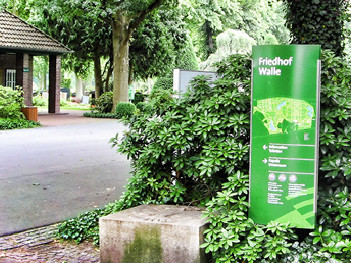 Image: Friedhof Walle, Bremen Germany, image by BobB, #47607961, FindAGrave, by permission. Could the other twin have been stillborn? If so, would the civil records be kept elsewhere? If the parents were Catholic, how would the church have handled stillbirths at that time? Would the parish cemetery have a special section for stillborn children? I sincerely hope you find this child. Stillbirths were recorded in the civil registration records and there’s no other record that we can find so far. The parents were Lutheran, not Catholic. An interesting fact…until the advent of routine ultrasound, twins were often undiagnosed until delivery. I remember many friends, as recently as the 1980’s, who did not know twins were on the way. And as an obstetrician, even with ultrasound, I still heard about “surprise” twins. Very interested in this post as my grandmother was a twin. The other twin died young. All we have is her name, no burial place.